A Chinese driver got the shock of his life when the car he was driving was blown onto the roof of a building during a fierce storm. The driver, of Yanbian city, Jilin province, said he had just turned a corner when it suddenly felt as if his car was flying through the air. 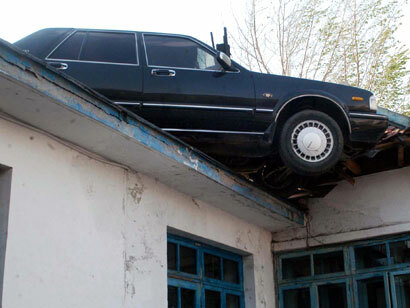 “Before I realised what was happening, my car had landed on the roof,” he told the China News Network. Police said the bizarre accident was down to the lie of the land, as well as the wind. “The road is actually a bit higher than the house roof,” a police spokesman said. Local meteorologists said the city had suffered an unusually fierce windstorm, with gusts reaching up to 31.5 metres per second. May 9, 2008 Posted by oldstersview | Cars, Strange, Uncategorized	| storm, wind | Comments Off on Thar she blows! Guitarist Shane Churchill gets to grips with The Beast – a six-headed guitar which has 40 strings and costs £739 – at Weymouth Music Shop in Dorset. There are only of 12 of the US-made instruments in [the UK]. Headline: “Spells Cast at Anti-Marine Rally in California” Where else? Members of the anti-war group Code Pink gathered Friday with a cauldron of flowers outside a controversial Marine Corps Recruiting Center in Berkeley, Calif., to use witchcraft to rally against the Iraq war. Code Pink members unfurled a pink banner reading “Troops Home Now” and waved signs as they began the protest, which they promised would include incantations and pointy hats for a “witches, crones and sirens” day. “Women are coming to cast spells and do rituals and to impart wisdom to figure out how we’re going to end war,” Zanne Sam Joi of Bay Area Code Pink told FOXNews.com.